The book you wish you’d had before you began investing. 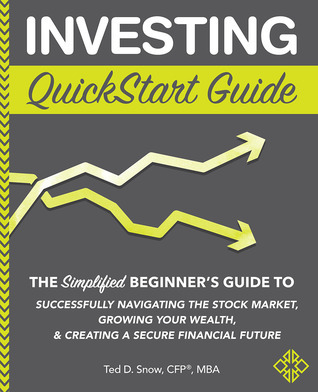 The Investing QuickStart Guide by Ted D. Snow is an excellent introduction into investing. I have not yet started to invest in anything as of yet. Part of the reason is the amount of income I do have and receive and the other being the bills I have to pay. I wished I had taken classes that taught me more on how to invest like some high schools have started doing. However, I do not have to real or practiced experience in this field. Therefore, I cannot debate on anything this author says, without doing some extensive research. But I have found a lot of his information to be accurate. Just not fully in-depth. It is a beginner guide into the basics and does mention some non-basic knowledge that had me confused at times. Simply because I wasn’t sure what he was talking about nor what it all entails. All in all, this gave me a great gateway into what investing is. I can recommend this book to others, who like me, don’t know anything but investing. If you need more, I recommend looking into more advanced books on the subject.